According to Alexa statistics, today Magento is the most popular CMS among the online stores of the Top 1 Million. The reasons for this are many, and include a built-in rich functionality, intuitive interface, a variety of templates, extensions and more. However, if you are familiar with this CMS, you already know that its main disadvantage – the low performance – is making itself felt. The value of this indicator for eCommerce can not be overstated: in addition to the number of targeted actions of the user being dependent on the speed of operations, it is in itself an important factor in the search engines rankings (eg., Google, whose representatives spoke directly about it). Add to this the importance of behavioral factors to SEO, largely dependent on the speed of the site. That is why SEOs and other professionals working with projects on this platform often wonder how to speed up Magento site. In our today’s article, we will not talk about alternatives to the Magento, and focus on a few simple steps that will help to preserve and increase the number of customers and also rise in search results. RAM amount – 1 GB. In this case, a small traffic page load time approximately equals to 1 second, which is a good indicator. However, it is guaranteed to begin to fall as the number of products and customers rises. The higher the server load, the stronger must be the hardware (particular attention should be paid to RAM), and the more important the integrated Magento performance tuning becomes. Naturally, Magento developers pay attention to user needs and feedback. They themselves are working to resolve important problems, so do not neglect the operational platform upgrades to new versions. Updates will provide new opportunities to work with the site, help eliminate the identified errors and optimize platform performance. The properly selected hosting will help to make Magento faster. The obvious recommendation, suitable for any platform, will be the choosing a dedicated server that is located near to where the main target audience is. The hosting also should be using the PHP-accelerators (eg. XCache, Zend Optimizer). The best choice for web server seems to be Nginx, as it has a relatively small footprint and high query performance, or the optimized Apache. All that remains is to save and restart the MySQL server. Use the “show global status” command to determine the server load. 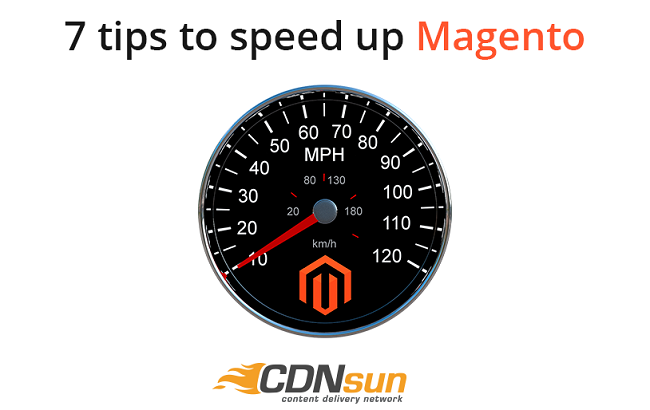 A simple way to Magento speed optimization is to configure caching. It can be enabled at the System – Cache Storage Management settings page. Select to cache everything (“Select all”), select the “Enable” action and apply changes (“Submit”). The status of all types now has to change to “Enable”. Like this, just in a few clicks you will significantly increase the speed of pages loading. Employ the services of content delivery networks like CDNsun. This is only some of the ways that you can use. Answering the question “How to speed up Magento website“, one should not only check the characteristics of the equipment or the basic functions of Magento, but also optimize the content of the pages (this is especially true for images). Share with us your own observations and best practices at CDNsun blog.